Garry Monk, now the longest serving head coach at Leeds United since Massimo Cellino became the owner. After defeats in Yorkshire derbies at Barnsley and Huddersfield already this year Leeds United will be desperate to avoid an unwanted hat-trick when they host Sheffield Wednesday this Saturday. There is more at stake than bragging rights this time with the Owls like Leeds looking to cement their place in the play-off places and keep alive their hopes of automatic promotion via a top two finish. Without a victory in their last five weekend games, United’s hopes of overhauling top two Brighton and Newcastle are fading, but like Wednesday they have put clear water between themselves and teams below the top six and will want to keep it this way to avoid a nervy run-in. Garry Monk’s players have not really handled the intensity of their recent derby games too well so he will be impressing upon them the need to step up this time in front of an expectant Elland Road crowd set to be well over 30,000. His team selection will also need to be spot on with a number of players out of form in recent weeks and only the resilience of the defence getting United through some games. It has been hard to work out the best team in recent weeks, particularly in the midfield and wide attacking positions where there are many options open to the head coach. 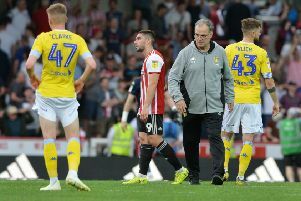 No midweek game this time will help freshen the players, however, while Wednesday were in action last night, losing to Brentford to end a run of four straight wins and miss the chance to go above Leeds into fifth. Their strength is their array of strikers as the January transfer window saw them add prolific scorers Jordan Rhodes and Sam Winnall to an already impressive trio of Gary Hooper, Steven Fletcher and Fernando Forestieri, all of who have good records against Leeds. The Owls also have former Leeds defender Tom Lees in their ranks along with one-time Elland Road loanees Barry Bannan and Will Buckley. United, meanwhile, have benefited from more stability this season with Monk now the longest serving head coach in Massimo Cellino’s time as owner, having been in charge for more than the 38 overseen by Steve Evans. Last Saturday’s game at Ipswich was Monk’s 40th in charge and he intends many more despite being linked with the vacant Glasgow Rangers job. He said: “I’ve enjoyed it from day one. “I’ve talked many times about the club, the history of it, the size of it and the challenge but also about the recent history as well. Recently there’s been a lot of suffering and not so much enjoyment. “I wanted to take that challenge and put a smile back on our fans’ faces and a smile back on the players’ faces; to bring back more positivity and ultimately have a way of playing that everyone could enjoy. “The club feels more united now. Everyone feels a bit closer together. Monk spoke about the responsibility he feels. He added: “You can see how it affects people here and with the fans I’d say (it affects) their lives. They support the club with their lives and that’s a big responsibility to have.